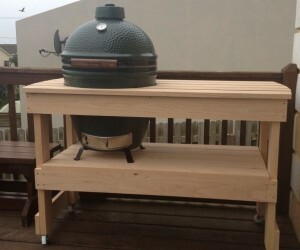 I had flirted with the idea of getting a Big Green Egg for some time before finally taking the plunge. It was the prospect of preparing a traditional Irish Christmas dinner for up to 20 people that spurred me into making the commitment so don’t give out to me for introducing the topic of Christmas in August. It’s just for a moment! We hope Christmas 2013 will be a very special gathering of our “clanns” and a good way to mark the end of the year of The Gathering. It will be Dermot’s first Christmas, we will have Claire and Mike home from Australia and all of us together for Christmas for the very first time. We will also have Shan’s MaMa and family from Beijing and Urumqi on their first trip outside China. Christmas dinner will be in our little house in Duncannon just three days before Shane and Shan’s Irish wedding and Dermot’s christening. So while the sun split the stones on Duncannon beach, my thoughts were already turning to how to organise the logistics of the day in a small kitchen dining room that will be too crammed with people to allow me get at the oven. 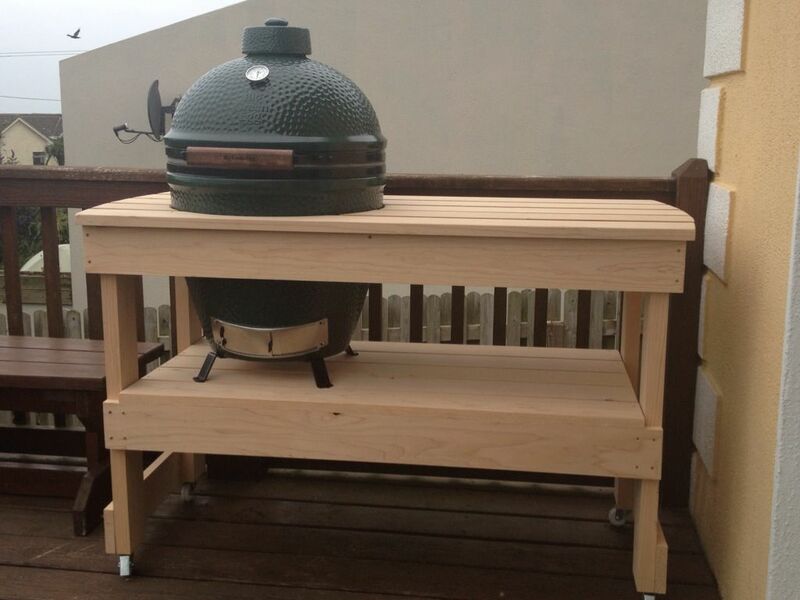 The following weekend my Mum and I took ourselves off to A Room Outside in Limerick, the only Irish suppliers of the BGE and it was delivered to my door the following Monday by PJ, just in time for Claire and Mike’s short holiday in Duncannon before returning to Australia. While PJ assembled it for me he passed on some of his own cooking ideas and expertise including how he uses it to cook fish on wooden boards. By this stage Claire’s mental picture of Christmas dinner was getting somewhat less idyllic than mine and she was visualising me, in similar pose, but wrapped in heavy duty rain gear while she tries to entertain the Chinese guests… Much practice needed. A long conversation the next day with the ever-patient Caroline and Liam of A Room Outside put me straight on some small mistakes I was making. 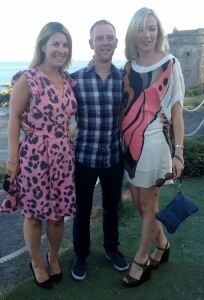 It helps that they are passionate cooks and Liam was a mine of useful tips and ideas. 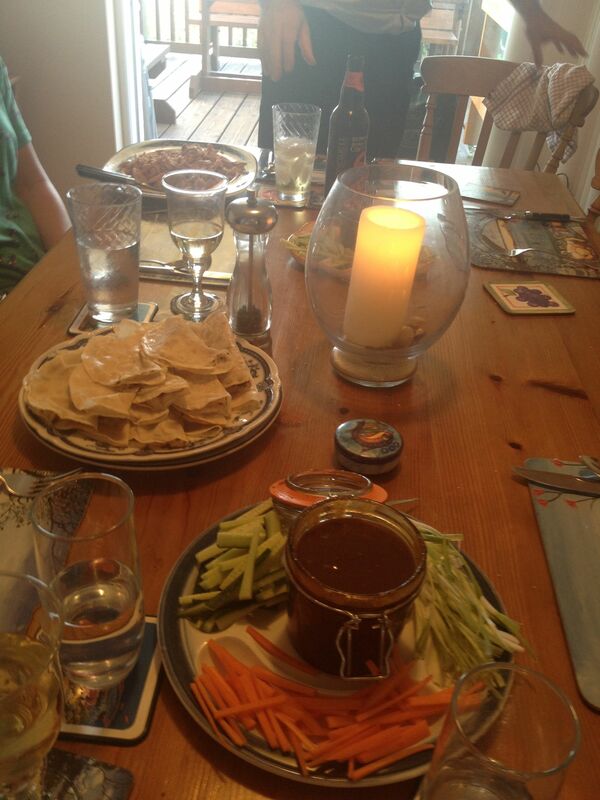 But before my slightly chaotic barbecue we did have one very successful BGE dinner for Claire, Mike and their friends Diane and Catherine and one I will definitely be repeating for our Chinese visitors – a variation of Peking duck. I took my inspiration for this from Kitchen 72 and you can follow David’s original recipe here on his excellent and beautifully photographed blog. 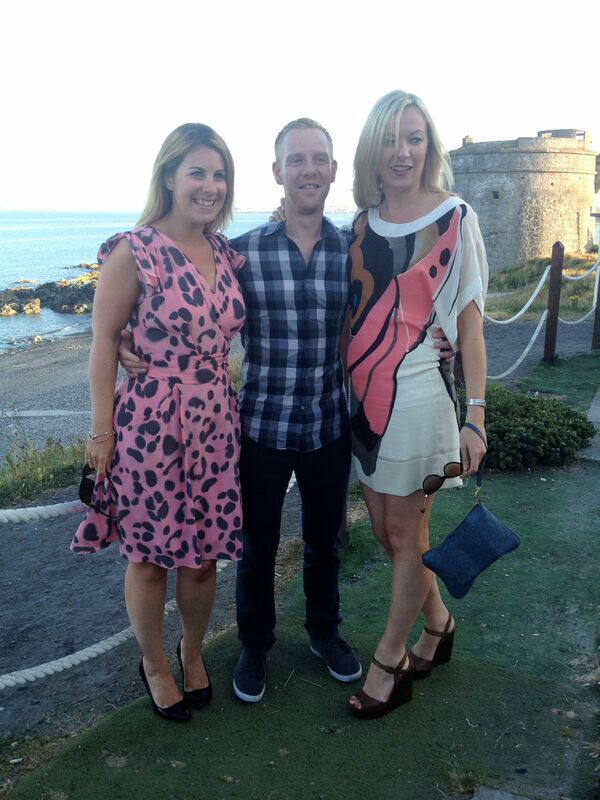 I have cooked his version at home in Dublin and can vouch for how delicious it is. I served up the duck the traditional manner similar to how it was served at our favourite Peking Duck Restaurant in Beijing XiHeYaYuang which I wrote about here. Thanks for the inspiration David. The home made hoi sin sauce is a very slight variation on the one Kitchen 72 used which came from Gwyneth Paltrow’s new cookbook. It is simply amazing. I blind tasted it and two very good quality shop bought versions on my guests and they all agreed the homemade version beat the others hands down. I made double the quantity in Gwyneth’s recipe because it keeps well and I used dark Chinese vinegar and a dash of dark soy sauce to add depth of colour and flavour. In XiHeYaYuang they serve the crispy duck skin with garlic sugar and a blueberry sauce. Shan and I had found the blueberry too sweet so I substituted a fresh batch of Tom Chef’s chilli jam. 2 Peking ducks, fully defrosted if frozen and allowed to dry out well in a cool airy spot – I use Silver Hill ducks. Prepare the BGE , using the Plate Setter to cook indirectly at 120 degrees C, adding a handful of soaked cherry wood chips to the oak and hickory lump wood for a mild smoky flavour. Dry the ducks out well (with a good blast from a hairdryer set to cold if necessary) and prick them them all over on a skewer, being careful to pierce the fat only and not the flesh. 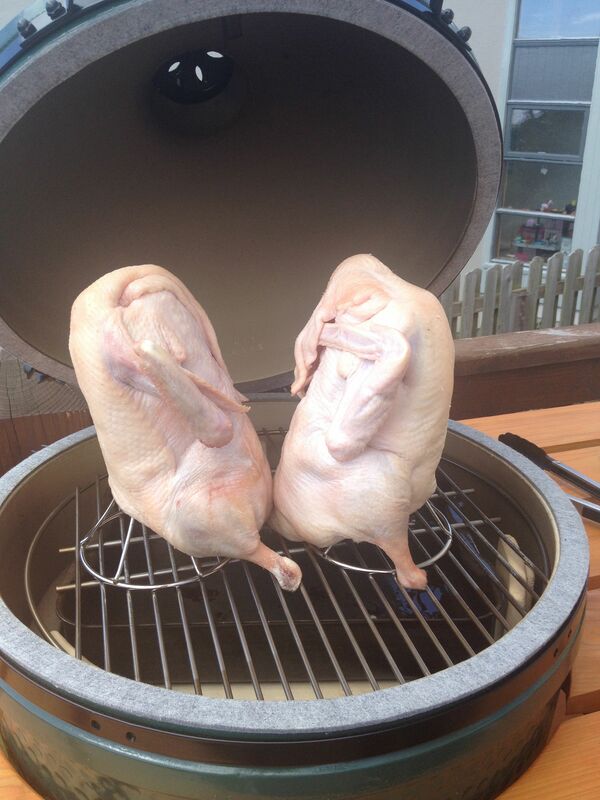 Place the ducks on two vertical roasters, sitting on the stainless steel grid over a roasting tin to catch the duck fat. 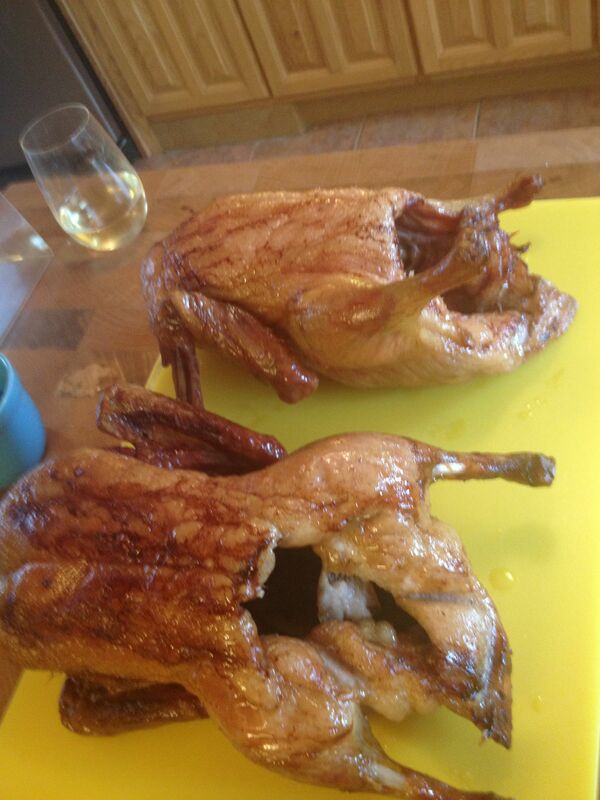 There is no need to baste or turn the ducks during cooking. Cook for about 4 hours or until the internal temperature deep in the thigh reaches about 83 degrees C.
Transfer the duck to a platter, tent loosely with foil, let rest for 15 mins then remove the skin in large strips, shred the duck meat, cover in foil and keep warm in a very low oven. Remove the plate setter from the BGE and whack up the heat to about 180 to 200 degrees C. Roast the strips of duck skin on the stainless steel griddle until crispy. Be careful this could take anything from 2 to 10 minutes depending on the heat of the BGE and the thickness of the skin so keep an eye on them. Add the garlic and five spice powder and cook for about a minute. Stir in the rest of the ingredients (except the soy sauce) and bring to the boil stirring constantly. Keep cooking for a few minutes until it thickens slightly. Add a good dash of soy sauce to darken as required. Store in a sterilised Kilner jar. Heat a dry, non-stick frying pan to medium-high. Brush a pancake with a little sesame oil and place another pancake on top. Dry fry each pair of pancakes on their un-oiled side until the pancake bubbles and crisps slightly – this only takes a few seconds. Peel the two pancakes apart and fold each pancake in two with the oiled side outward. Place on a platter and cover with a damp tea towel until ready to serve. Repeat with all the rest of the pancakes until you have a big enough pile for all your guests. This sounds like it will take a long time but you actually get very fast at it. Just keep an eye on the temperature of your pan and reduce if the outsides of the pancakes blacken too much. carrots, cucumber and spring onion. Each person just helped themselves, brushing a little hoi sin sauce on a pancake, adding duck and vegetables and wrapping to eat from their hands. We dipped the crispy duck skin in the garlic sugar and chilli jam and ate it on the side. Cue sighs of pleasure as platters of food moved up and down the table, glasses tinkled and, as the night wore on, we wept with laughter over the funnier incidents and mishaps from our girls’ early twenties. Until finally there was just one pancake, two shreds of duck and a lonely piece of cucumber and spring onion left. 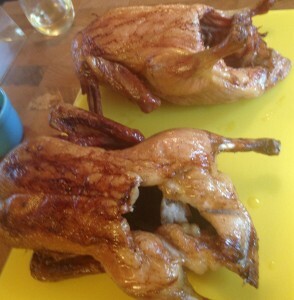 The duck was as moist and succulent as I had hoped it would be with the crispy skin a guilty pleasure. Me and my Big Green Egg might just become friends after all. PS: Don’t forget there is a competition on the blog for a Christine Manfield cookery book to celebrate Shananigans being one year old and it closes at midnight tomorrow. You can find it here. And thanks to Shane for the nifty new icon at the bottom of each post which allows you to print all or part of a post or save it to PDF, very handy for saving recipes. This made me smile very much, Julie. 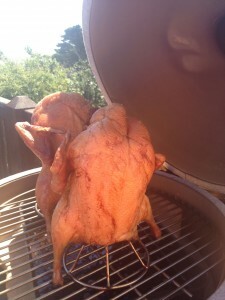 You’ll surely have the hang of using the BGE by Christmas. Sounds like something one needs to get to grips with. But it will be so worth it. 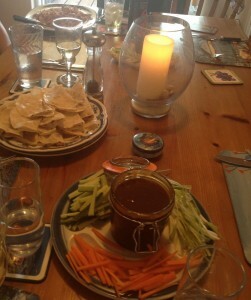 Must try out the homemade Hoi Sin sauce and pick up,some duck from Silver Hill in Emyvale for the weekend.